Chinese Water Deer are a non-native species introduced from Chinese populations along the Yangtze River where they are on the IUCN ‘red list’ as a vulnerable species. They are said to be the most primitive living member of the Cervidae family, in part because the buck carries large canine teeth or tusks and has no antlers, characteristics that other deer have evolved beyond. 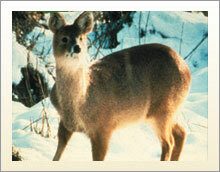 This makes the Chinese water deer a biologically important animal. Preferred habitats are woodlands next to grazing areas and more open and wet areas such as reed beds, boggy areas and river edges. They adapt readily to open areas of grassland such as agricultural fields and parks, and are often be seen out in daylight.